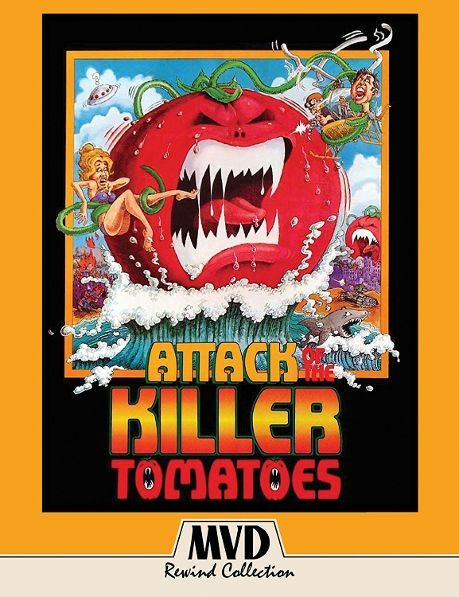 Perhaps the movie with the best title ever, Attack of the Killer Tomatoes is now out on Blu-ray from MVD’s new Rewind Collection, a new line focusing on some old films. If you’ve already seen this film then you know if it’s your cup o’ tea. If you never have, well the title sort of says it all. But grab your parachute, don’t ask for ketchup, and let’s find out. Attack of the Killer Tomatoes is goofy, silly fun, the kind that only could have happened in the 1970s. That’s code for not being politically correct in the slightest. No, it’s not purposely offensive and it doesn’t delight in being off-color, it just doesn’t care if its humor steps on anyone’s toes. So the easily triggered should probably steer clear of this one. The humor is also often very broad and nonsensical. Think of the Airplane! movies, only not as highbrow. Lastly, there really is not much horror to be had here, but come on, it’s about killer tomatoes, who doesn’t want to see that? Now on to the extras that MVD gave us for this new Blu-ray/DVD two-pack. First, it must be said that this is a good, but not great, transfer. However, this is easily the best-looking this flick has ever been, by a long shot, so yay for that. Now there is a commentary track with the director John De Bello, the writer Costa Dillon, and actor Stephen Peace. There is a featurette “Legacy of a Legend” that’s your basic retrospective and runs 14 minutes long. There is a special about a helicopter crash used in the movie that was actually real and that is nearly four minutes long. There is the short film, also called “Attack of the Killer Tomatoes” that was made before the feature. It’s over 17 minutes and comes with or without additional commentary. Even back then it had the awesome Attack of the Killer Tomatoes theme song, which made me happy. There is another 8mm short film, “Gone with the Babaseland” that is a silent film, so it comes with commentary and runs 32 minutes. There is an interview with the San Diego Chicken who appears briefly in the film. There is a “special” about a guy dressed as a tomato talking to various people in Hollywood to see if they know about the film, and then the same guy does a “where are they now” bit about the cast and crew who made the film. There is a three-minute featurette about the government conspiracy that attempted to keep the truth behind the killer tomatoes a secret. There are five sing-alongs for five of the silly songs that appeared in the movie, complete with a bouncing tomato to help you sing. That’s nice of them. There is also a two-minute special on the slate girl from the movie because why not? A collection of deleted scenes and some trailers bring this impressive list of extras to a close. I love this silly, stupid, politically incorrect movie that would in no way be made today. It’s not high art or packed with recognizable names, but it is funny and that’s all I want from my comedies. If you like that in your comedies too, then give Attack of the Killer Tomatoes a try and if you do that, make sure you get this new MVD release. Consider it very highly recommended.